September 2015 called for another milestone for SHLOK. We launched the 2nd chapter of SHLOK X in Bangalore. When we at SHLOK started, our aim was to improve the quality of education in rural and government schools with the focus on English and Computer Science. 1 year, and 6 successful chapters along the way, we met Dr. Sugata Mitra who is best known for his ‘Hole in the Wall’ experiment, and who is leading the ‘school in the cloud’ model. This struck a chord! When a slum in Delhi self-learned everything about the internet through an isolated computer with an internet connection, we wondered what a classroom full of children can do. And SHLOK X was born. A model that allowed kids to learn through the internet. This enabled, firstly, a fun way of learning, followed by a lot of other benefits – brewing curiosity, 360 degree learning, ease of tracking progress etc. With this began the redefined journey of SHLOK. What has been the biggest challenge to launch a SHLOK X? Starting a SHLOK X chapter involves – fund raising, sourcing laptops and tablets, sourcing internet connection and setting up. Fund raising and finding quality laptops and tablets have been the biggest challenge. These take the longest – sometimes several months. Why is it so worth it? For the Indiranagar chapter, we received generous donations from friends and our network and raised 53,000 INR. We scouted for some organization where we can buy 2nd hand quality laptops from, but we hit no success. Finally went in for the kids tablets from Micromax. On the day of the launch – the kids in the class knew something was coming up but had no idea they were being grouped into 4 to share a tablet. As soon as we got in the tablets and set up the wi-fi router, the kids could no longer contain their excitement. There were eyes brimming with pleasure, curious looks, shrill voices and so much excitement. We had trained the teachers in the school the previous week on how SHLOK X would run. Every Saturday – 2 hours of internet based learning with supervision. 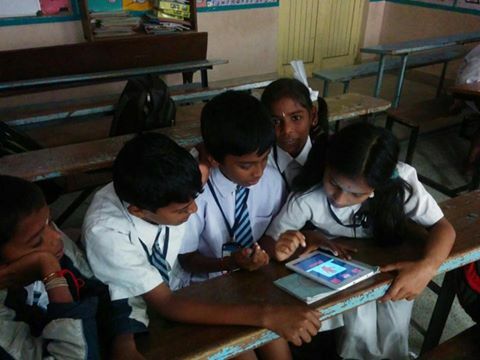 In the first class, the kids got to play around with various learning apps. And suddenly everyones spellings and answers were correct. They had their brightest smiles on and did their best to stop the session from coming to an end! We sincerely thank our donors for helping us make this happen! As always the difference that can be made can only come from you the people. So we ask you ponder this for a moment- there are over a 1000 schools in each of our cities which need help or volunteering in some form. Will you step forward and be the change? Posted on October 23, 2015 by shlokorg	• This entry was posted in Social service. Bookmark the permalink.